is giving way to the person I want to be. 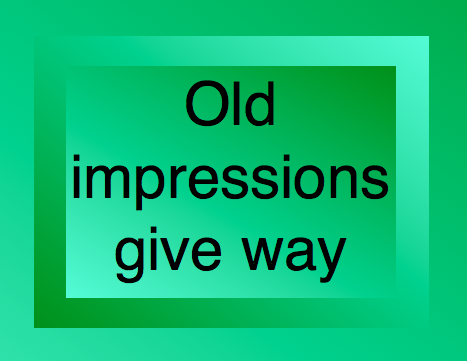 I replace the old impression consistently. It sets up a new vocabulary of attraction immediately. become a distant discordant melody. surrounds, uplifts, embraces me repeatedly. Old pains are released, I feel my freedom tingling. Exhort, affirm and celebrate my entrance into the Kingdom. I do not have to fix the old or anything from the past. Once I no linger live there, there is no receiving address. my mind, then body, all surroundings, people, places, things. I live anew in a new world. I see through different eyes. I understand through different thoughts. I’m valuable and prized. If you see me in my new form, you are a friend indeed. You, too, have walked a growing path, you, too, have sensed the needs. A few are called, yet more and more reach out the this new message. That we are One. With new Resources, we’ll see what life now presages.